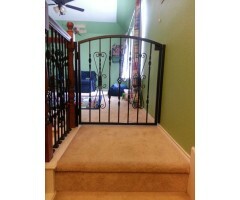 This gate was built to compliment the stair and balcony rail with an arch to add interest. .. Perfection in balance, detail, and strength. 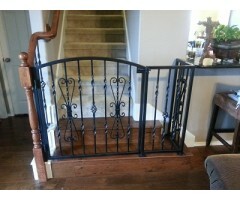 This gate is a gorgeous addition to the quality of this home. .. 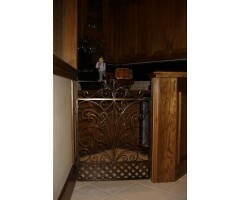 Hammered bar and elegant scrolls create a beautiful child or pet protective stair gate. .. 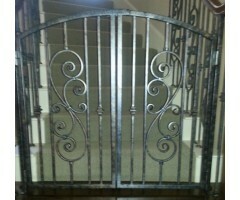 Single knuckle bar with double S scrolls on this gate follow the pattern of the stair rail providing beauty and safety for your children and pets. .. 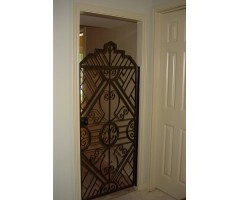 This interior door gate is a beautiful addition to the home while providing privacy or safety to any room. .. 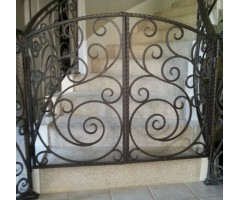 This beautifully designed interior gate makes it clear that this area is for the VIP with special privileges. .. 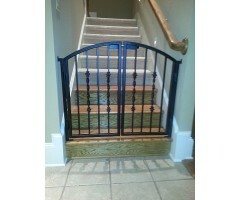 This gate was designed as a barrier from the stairs for the safety of children and pets. 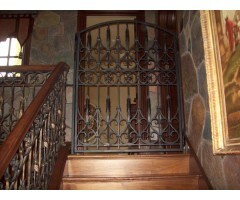 ..
A wrought iron gate with an arch is perfect to add some visual curve to an otherwise square room. .. This beautiful design was used for an interior protective gate, designed to compliment an Art Deco syle with it's angular, symmetrical, geometric forms. .. 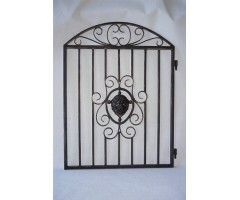 This classic arch topped gate is a perfect compliment for any design style. .. 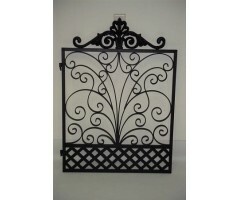 The three elements of design on this gate make it visually appealing to the eye. A perfect look as an interior gate, while very easily nicely enlarged for your exterior driveway, courtyard, or patio garden gate. .. 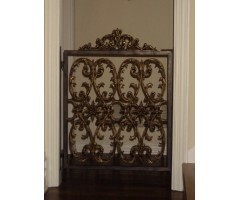 This beautifully appointed pet gate is like an exquisite piece of jewelry for your home. ..